'McGrath from Moyasta Shore’ is the title of a song that recounts the exploits of Patrick McGrath on the occasion of the eviction of his family from his father’s house on Thursday, 26th July, 1888. 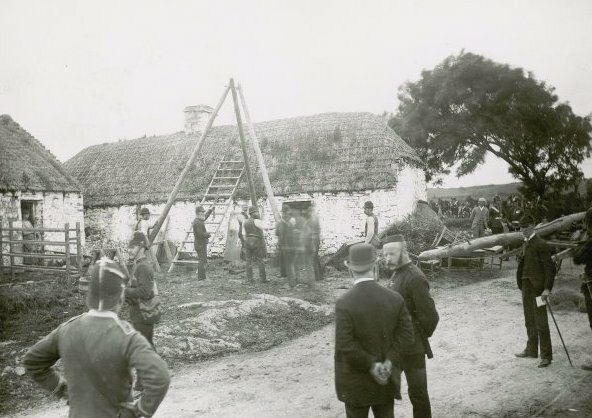 The eviction was one of a series of twenty-two carried out on the Vandeleur Estate between October 1887 and July 1888. McGrath’s house in Moyasta is midway between the towns of Kilkee and Kilrush in West Clare. Vandeleur tenants had adopted the Plan of Campaign (1886-91), a Land War tactic used on many estates by tenants against landlords. Many tenants had fallen in arrears with rent in the 1880s due to a depression in the prices of crops and of livestock. The plan tried to secure a reduction of rent for tenants in arrears and if the landlord refused to accept this, rent was withheld and put into a fund for evicted tenants. Balfour and Croker are mentioned in the song. Arthur J. Balfour was the Chief Secretary (1887-91) and nephew of Lord Salisbury, the Conservative Prime Minister. Captain E.W. Croker was Sub-Sheriff of Clare. Mathias McGrath, Moyasta – the battering Ram, 1888. He laid them in their gore. Outside the Ram did sound. And knocked him to the ground. And his life near came to an end. He went to meet his foes. Our champion brave to crush. To take him to Kilrush. And broke through Balfour’s laws. ‘The Clare Journal’ gave the Kilrush evictions of the period coverage. The paper was published twice weekly (Monday and Thursday) and in the edition of Monday evening, 30th July, 1888 a lengthy account is given of the McGrath eviction which took place on the previous Thursday. Mathias McGrath’s was the house selected for the first visit. It was a decent looking, rather old, but well kept place with an air of neatness about it that contrasted somewhat favourably with some of its neighbours. His rent was £18, and £39, I am informed, is due to last May; valuation, £14-4s. Before 1874 the rent was £17-4s. The house was found to be stoutly barricaded. The evicting force seemed to be aware that they would meet with great resistance and the police and military were scattered around the place, forming the usual cordon, inside which none were admitted save the pressmen and those provided with passes. fought with the courage of a lion, but the numbers against him were more than a dozen such men could cope with, and he was at least pulled violently, still resisting, through the breach ……..with the blood pouring from his battered head, while to add to the painfulness of the scene, his mother was filling the air with her shrieks and lamentations. Patrick was handcuffed. His mother wiped the blood from his face and his sister had her arm around his neck. He was charged under the Crimes Act with having assaulted the sheriff and the district inspector in the execution of their duty. He was remanded without bail and the forces of the crown surrounded him as the group set out on their return journey back to Kilrush. As he entered on the public road a cheer was raised from the spectators. The prisoner acknowledged this with a cheer for the Plan of Campaign, jumping in the air at the same time. Then putting forth his apparently great strength he completely smashed the handcuffs which bound his wrists, kicking them from him as he would a football. The people cheered wildly at this scene but McGrath was instantly seized and re-handcuffed, his hands being put behind his back. Patrick McGrath was taken to Kilrush House, the Vandeleur residence. (It was badly damaged by fire in 1897). Later that evening he was transferred to the Bridewell (now Supervalu). A few weeks later his case came up for trial in Kilkee. According to the ‘Clare Journal’ of 23rd August, 1888 Patrick McGrath was sentenced to two months imprisonment but was allowed out on bail pending appeal. The Vandeleur Evictions’ Appeals Trails took place at the Kilrush Quarter Sessions the following April and McGrath’s case was reported by the ‘Clare Journal’ of 8th April, 1889. Judge Kelly in giving judgement imposed a sentence of six months on Pat McGrath. McGrath from Moyasta Shore is the story of Pat’s courageous defence of his family’s homestead from eviction by violent means 126 years ago. The Lawrence photograph is a visual prelude of the events described in the ‘Clare Journal’. McGrath’s display of strength for a virtuous cause appealed to the popular imagination and a song was composed locally to preserve the memory of the event. Pat was not acting alone. His stand like that of some of his neighbours was part of the Plan of Campaign involving 20,000 tenants on various estates throughout the country. The incident was a local manifestation of the developing national consciousness that culminated in the signing of the Treaty on the 6th December, 1921. 1. J.J. Downes for the provision of a handwritten copy of the song. 2. Matthew Birmingham for sharing details about the Moyasta evictions. 3. Noel J. Mulqueen for his publication The Vandeleur Evictions in Kilrush 1888. 4. Peter Beirne for his assistance in the Local Studies Library, Ennis. This article was first published in ‘The Other Clare’ vo. 29 (2005), pp 29-30. Clare County Library is grateful to Maura Egan for permission to reproduce this article.